With last week's news that Oslo had pulled out of the 2022 Winter Olympics, I got really sad—mostly that we wouldn't see the beautiful identity from the architects at Snøhetta brought to life. 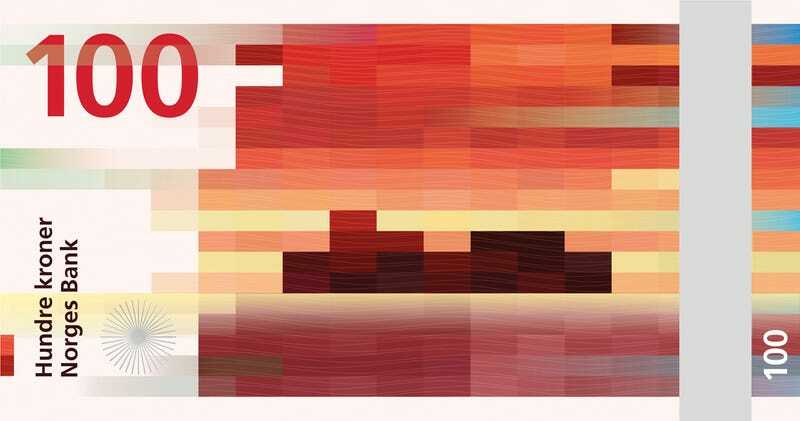 But here's a consolation: Snøhetta won a competition to redesign Norway's currency. And the pixelated landscapes they designed are absolutely gorgeous. The competition sponsored by the national Norges Bank called for designs around the theme of "the sea" which resulted in some absolutely gorgeous concepts. In fact, instead of picking just one winner, they actually merged two different designs from two teams, Snøhetta and The Metric System. So instead of choosing a single front-and-back combo, which is called obverse and reverse in currency-speak, they chose one obverse design from The Metric System and a reverse design from Snøhetta, which seems like a rather democratic way to decide on a winner. Snøhetta's idea is not only beautiful—seemingly abstracted oceanfront scenes, rendered in colorful pixels—but high-concept as well. The various denominations correspond with different levels on the Beaufort wind force scale. So the 50 kroner banknote is breezy, with abbreviated, mosaic-like squares, and the 1000 kroner is a downright gale, with long bars that make it look like the scene is in motion. On the other side, the designs by the Metric System are a bit more traditional, but still feature lovely illustrations of seafaring objects and buildings.